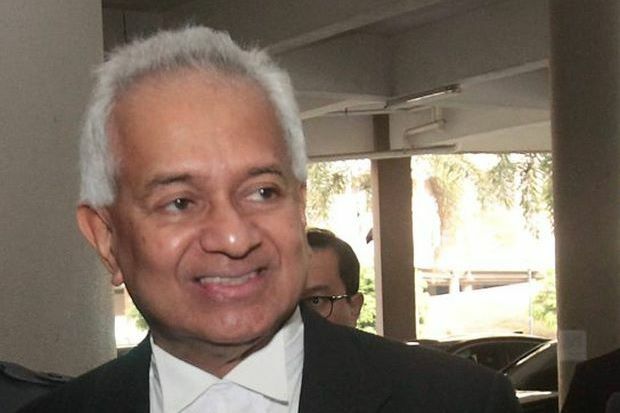 KUALA LUMPUR (Bernama): The prosecution will prove that Datuk Seri Najib Tun Razak had used his position as prime minister and finance minister to obtain for himself gratification of RM42mil, Attorney General Tommy Thomas said in his opening statement in Najib’s SRC trial. He said that the prosecution would establish that the accused was directly involved in the decision on behalf of the Malaysian government to give guarantees for the loans amounting to RM4bil received by SRC International Sdn Bhd from Kumpulan Wang Persaraan (KWAP). “It is my duty and privilege of opening the first trial in our courts against a former prime minister who for nearly a decade, occupied the most powerful office in the land and wielded near absolute power. “The accused during his entire period in office as prime minister of which time these offences were committed simultaneously held the office of Minister of Finance, thereby combining maximum political power and control of the nation’s purse,” he said told the High Court here Wednesday (April 3). Thomas said in holding the office of the prime minister and thus the nation’s highest elected public office and head of government, the highest trust was reposed by the people in the accused. In such circumstances, the law demanded the highest standards of care in the discharge by the accused of his duties and obligations as trustee of public offices, he said. “Not being satisfied with the holding of the twin positions of prime minister and minister of finance, the accused was also appointed the chairman of the board of advisors of 1Malaysia Development Bhd (1MDB) and advisor emeritus in its fully-owned subsidiary, SRC International Sdn Bhd,” he said. Najib, 66, is facing three charges of criminal breach of trust, one charge of abusing his position and three counts of money laundering over SRC International Sdn Bhd funds amounting to RM42 million. The Pekan Member of Parliament is alleged to have committed the offences at AmIslamic Bank Berhad in Jalan Raja Chulan and the Prime Minister’s Office in Putrajaya between Aug 17, 2011 and Feb 10, 2015. Najib, who was the sixth prime minister of Malaysia, is the first former prime minister to find himself in the dock. Thomas said the trial before Justice Mohd Nazlan Mohd Ghazali is the first of many kleptocracy-1MDB-linked prosecutions. He said a common feature of both companies (1MDB and SRC International) was that the true power directing and managing their affairs did not lie with the board of directors – as is required by law and is the universal practice wherever companies carry on businesses – but with Najib by virtue of his holding these two positions. “The operation of Article 8(1) of the Federal Constitution that ‘all persons are equal before the law’ is amply demonstrated by this trial. “The accused is not above the law and his prosecution and this trial should serve as precedents for all future holders of this august office,” he said. In proving the ingredients on the charge of abusing his position, Thomas said evidence, both oral, documentary and circumstantial would be led by the prosecution to establish the proposed establishment of SRC International Sdn Bhd, the proposed setting-up of a RM3bil grant, SRC International’s request for a government loan for RM3.95bil, appointments of SRC International’s Board of Directors, and one Nik Faisal Ariff Kamil as CEO of SRC International. Thomas said the prosecution would also establish matters that led to the approval of the Malaysian government, through the Finance Ministry, the issuance of a RM2bil government guarantee in favour of SRC International and for the issuance of a further RM2bil government guarantee in favour of the company (SRC International). He said evidence will also be led regarding monies totalling RM42mil, sourced from SRC International, were channelled through the company accounts of Gandingan Mentari Sdn Bhd (a wholly-owned subsidiary of SRC International Sdn Bhd) and Ihsan Perdana Sdn Bhd (purportedly appointed as SRC International’s corporate social responsibility partner). “The accused, between 17 August 2011 and 8 February 2012, as a result of the aforesaid, had received as gratification the said monies totalling RM42mil into his AmPrivate Banking-1MY no. 211-202-201188-0 and AmPrivate Banking-MY no. 211-202-201190-6 bank accounts,” he said. For the criminal breach of trust (CBT) charges, Thomas said the prosecution will establish that Najib, as prime minister and minister of finance, and advisor emeritus of SRC International, whilst entrusted with monies belonging to SRC International, committed CBT in respect of the RM27mil, RM5mil and RM10mil belonging to SRC International. “Evidence will be led by the prosecution to establish that a special resolution was passed to amend SRC International’s articles of association to appoint the accused as advisor emeritus. As advisor emeritus the accused shall advise the company’s board on material matters and matters of strategic interest to Malaysia, and that the board shall give due consideration to and implement any advice of the advisor emeritus in the best interest of the company,” he said. Thomas said Najib had dishonestly caused himself to wrongfully gain RM42mil and caused SRC International to wrongfully lose RM42mil. He said the sum of money was remitted to Najib’s AmPrivate Banking account through the company accounts of Gandingan Mentari Sdn Bhd and Ihsan Perdana Sdn Bhd between Dec 24 and 29, 2014 and between Feb 10 and 2 March, 2015. He said the prosecution would also provide evidence that Najib had engaged in money laundering by receiving RM42mil, being the proceeds of an unlawful activity, in his AmPrivate Banking account. He said evidence would also be led that Najib had issued 15 cheques from his bank account totalling RM10,776,514.00. “Evidence will also establish that in December 2014, the accused’s credit card was charged US$130,625 for expenses made at Chanel, an exclusive fashion store in Honolulu,” said Thomas. He said the prosecution would prove that personal cheques were issued, among others, as payment for renovation works carried out at the accused’s residence at Jalan Langgak Duta, Kuala Lumpur, the accused’s residence in Pekan, Pahang as well as cheques were issued to various Barisan Nasional component political parties. “The burden is now on the prosecution to prove, beyond a reasonable doubt, that the accused, Mohd Najib Abd Razak is guilty of the criminal charges preferred against him at this trial,” he added.